I have to say, it was perfect timing for this prompt (no pun intended). Lately I have been feeling out of sorts about blogging. I've only written a couple of times in the past two weeks, because I just can't seem to get the words to come out. Nothing is going on. There is no earth shattering news to share. I'm not overwhelmingly busy--actually just the opposite, I have lots more time than I normally do during the year. Lately I've had a nasty and unwelcome case of the "comparisies." I feel like what I have to say might not matter, or doesn't stack up to what others have to say. I feel like I don't have any original ideas. I feel like my design is plain. I feel like my photography isn't good, and that it stinks that all my photos are taken on my phone. Blah. But you know what? I need to stop letting my fear of stacking up to others keep me from doing what I love to do. I'm realizing more and more in blogging (and in my life in general), that I'm the only one who notices things if they aren't perfect. Most of the time people won't even notice the difference (or even care!). The image wasn't pinnable? Who cares! No snappy title? Whatever! Post amplified to social media? If i get to it. I just need to take a chill pill. Always, Al has helped me to grow as a person so much during the time I've been writing it. Blogging has been one of the best hobbies I've found. I have made many friends through this space, flexed my writing muscles from time to time, learned new skills, and it has helped me feel not so lonely during a move across the country. I've decided that for this space, I'm not going to be striving for perfection anymore. Because I just can't hold myself to that standard and keep this as a hobby. It's too much pressure, and perfect is boring! :) I'm going to write content that I want to write, not what I think my readers will want to read. I'm gonna keep taking pictures with my phone, because that's how I like to take pictures, darnit! Here's to releasing my expectation of perfection in blogging, and striving to be true to myself. I hope you will join us in linking up for this weeks prompt: releasing your expectation of perfection! Perfection. We put so much pressure on ourselves as bloggers. As long as it's all still fun, that's well and good, but if it's stressing you out or upsetting you, it's not worth it! You are definitely not alone! I think we all need to take breaks sometimes :) Thanks for joining this week friend! Thanks friend! Writing this was very theraputic. I think I am getting back in my groove now! I agree, and I am not against taking a break when I need it. This is completely a hobby, so I don't need to push too hard. I almost never notice if images aren't pinnable -- i actually don't think this is as big of a deal as bloggers make it out to be! But we kick ourselves if we don't have it all. We can't do everything, and I think it's better to do some things better than try to do everything not as well. Yes. I keep thinking of the term "rat race," and that is so bad. That is totally NOT what blogging is about. I am definitely going to start focusing on some content that is fun for me to write, not just what I think people want to read. You know, I heard that same advice a couple of weeks ago (specifically about social media), and it's kind of all now making sense. There's no one size fits all model for blogging. Very thoughtful and wise. Wish I had figured this out when I was younger. 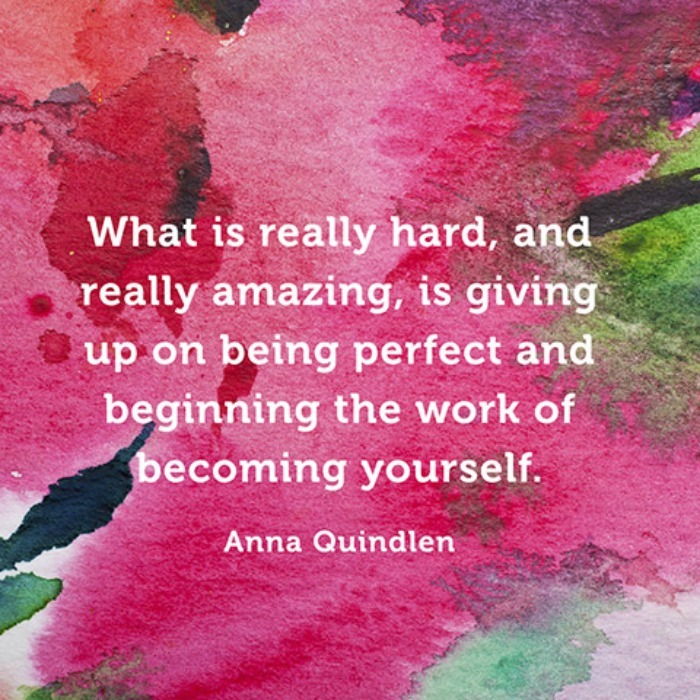 Perfection is exhausting!! One of my favorite quotes is; "Be who you are, and say what you feel, because those who mind don’t matter and those who matter don’t mind." In other words, those who care about you aren't looking for perfection. They love and support you, imperfections and all!